The travels of Barbara Reed are over: she came back to collect her bag after her walk across La Mancha on the Camino de Levante. Then she went to pick up her MGB which broke down in Santander (not so reliable as a donkey) and now she is back in France with her donkey Rosie and Filou the mule. Thank you for looking after us. Even Morris began to look well-groomed while you were here. He is now covered in dust, straw and has matted tummy fur because he has been sitting in wee again, so next time please spend more time grooming Matilde and me, and less time on the rood norty Morris and that silly horse-headed donkey Aitana. Thank you, Rubí for your shorter than usual Tuesday blog. The equusasinus.net blog is going to have a section for well-established regular visitors with news of our current plans. For the moment these plans are confidential. We would like to share them with those loyal readers who have followed this blog – and the previous brotherlapin.wordpress.com blog – during these past six years, but you will need a password to access these pages. Regular readers still in recent contact will receive the password by email before the end of this week. If you are left out of the mailing, please leave a comment here on this blog post. The password will be sent to you. We have exciting news to share but we have to be careful because the blog is still being stalked. The pages will be in this new section of the blog: equusasinus.net/project/ which is currently a test page and is password protected ready for the new content to be added. The password protection is a temporary measure: all pages of the blog will be freely accessible again when news of our project is not such sensitive information. The real problem with having a local stalker, just looking at the blog to snoop, is that my plans will be all around the village in 24 hours. I am sorry you have had so much trouble with your blog. The Internet is such an odd place, so beautiful and terrifying. 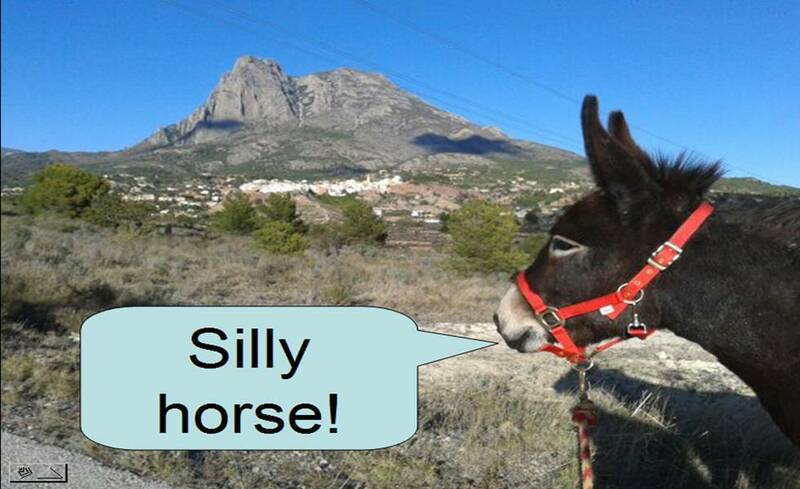 We all need to be more like donkeys. It’s not too bad: once in a while you get nutters coming to the blog for their own purposes. They go away eventually. Lots of things happening! Will have it all on the new password-protected Project page shortly. You and about fifty other regular readers known to me will get the password by email when the Project page goes live. Hi Gareth, I have followed your blogs for many years though I am not a commenter. If it is possible, I would love to learn about your new Project. That’s the kind of scenario I was rather dreading. I knew that would happen! I really need to think about a gatekeeping method to deal with that kind of enquiry. I will email you. I can see your IP address and it is not the same as the stalker. But you can understand the need for caution with any first time commenter at present. I will write shortly. Gareth, Trooper and Clementine eagerly await your news. They are prancing around in anticipation! They promise to keep mum about the holy password. Hi Jim. Password mail out will be done shortly. It will be time-consuming as I can’t do one general email to all: I must respect each person’s email address and so I must do fifty eight separate emails! Great news to share. You emailed me last week – thank you- but I’m leaving a comment anyway as your news sounds rather exciting! I hope things are looking up for you. My donkeys had their hooves trimmed today so they’re wandering around admiring their pretty little toes. wooooh, it’s the Lapin Code. Get yourself at least one Albino Donk !!! Best of luck, Gareth – I wish you well. Asinara: “inhabited by donkeys”. I like it. What’s “asinorum” (you’re the Latin expert). I didn’t get a password either, although I always read the donkey emails that land in my inbox. Not a regular follower, but more in the way of being a fair weather traveller. Gissa password then, otherwise I’ll never know what you’ll be up to next. Neighbours, eh – who’d have ’em?